Bangladesh women’s cricket team got the track defeating Pakistan by seven wickets in the 4th match of the six-nation ACC Women’s T20 Asia Cup at Kinrara Academy Oval, Kuala Lumpur, Malaysia on Monday. Bangladesh chased down a target of 96 for 3 in 17.5 overs after restricting Pakistan to 95 for 5 in 20 overs. NahidaAkter’s (2/23) helped restrict Pakistan before opener Shamima Sultana (31 off 33b; 3×4), unbeaten Nigar Sultana (31* off 35b; 3×4) and FahimaKhatun (23* off 19b; 1×4) made short work of the chase. Nigar Sultana and player of the match Fahima Khatun shared an unbeaten partnership of 34* off 5.1 overs in the 4th stand, starting from 61/3 in 12.4 overs after Shamima Sultana’s dismissal, to shore their win. Anam Amin (1/9), NashraSandhu (1/18) and Nida Dar (1/28) equally shared three wickets for losing Pakistan. Sent in to bat first, Pakistan got off to a decent start, with Nahida Khan (13 off 19b; 2×4) and Muneeba Ali (7 off 9b; 1×4) putting on 22 in 4.1 overs. But the Bangladesh’s left-arm spinner NahidaAkter sent off two quick wickets — Nahida Khan and Muneeba Ali — in the fifth over to derail them. Pakistan largely thanks to Sana Mir’s 21* off 23-ball with two boundaries, late in the innings, while Javeria Khan (18 off 27b; 1×4), Nida Dar (17* off 18b; 1×4) and skipper BismahMaroof (11 off 14b; 1×4) were the other double digit scorers for the side. 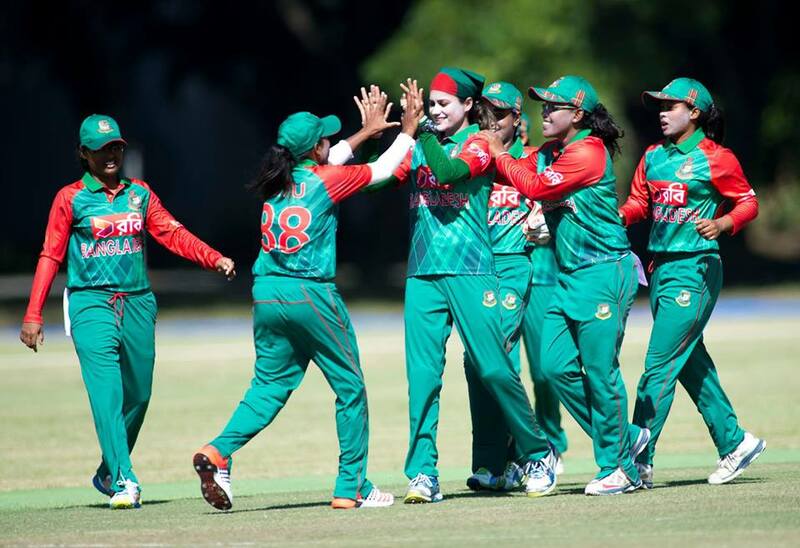 Rumana Ahmed (1/6), FahimaKhatun (1/18) and skipper Salma Khatun (1/25) equally shared three wickets for Bangladesh. Bangladesh started their campaign in the continental event with a six-wicket defeat against Sri Lanka at Royal Selangor Club on Sunday, while Pakistan got an eight-wicket victory against Thailand in their 1st match at Kinrara Academy Oval also on Sunday. Despite the loss, Pakistan is above the Bangladesh team by virtue ofnet run rate. Both sides collected identical two points each from their two outings apiece, recording one win and one loss. Bangladesh got the 4th place while Indians are leading in the table with all-win four points from two matches, followed by Sri Lanka with two points from one game. In their next fixtures, Bangladesh will take on India while Pakistan to play Sri Lanka on June 6.